Daniel Sturridge: leading the line. DANIEL STURRIDGE IS “feeling good” and believes he is “healthy” enough to lead from the front for Liverpool. A succession of injury problems have prevented the England international from making the impact expected of him at Anfield. Despite enjoying a positive start to life on Merseyside, as he worked alongside Luis Suarez, the 28-year-old has struggled to keep himself off the treatment table. 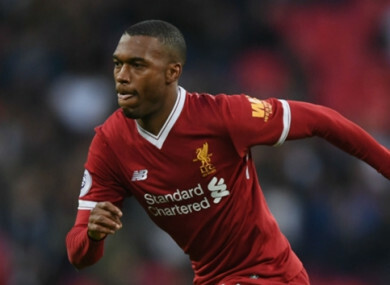 He has been able to make 11 appearances for Liverpool this season, though, and with Sadio Mane, Adam Lallana and Philippe Coutinho having been nursing knocks of late, Sturridge is determined to take his chance to shine. He told the Liverpool Echo ahead of another potential run-out against Maribor in the Champions League on Wednesday: “We’ve been in the Champions League two times since I’ve been at the club. “Obviously I missed out the first time but hopefully I can be a big part of this European campaign. “I played in the competition many times for Chelsea and we won it when I was there. “It’s nothing new to me. You want to be playing at this level. I am ready for when the opportunity comes. “The manager picks the team. We’ll have to wait and see what he decides. “From my perspective, I’m feeling good. I want to stay healthy and I want to keep scoring goals for the team. Sturridge has not found the target in Europe’s elite club competition since November 2010, and not started a Champions League fixture since turning out for Chelsea against Napoli in March 2012. He was, however, among the goals in his last outing for Liverpool against Huddersfield – his 100th effort at club level – and is looking to find a regular run of games which will allow him to return to his best. Sturridge added: “For all strikers, it’s important to be playing to get your rhythm to be able to produce your best football. “You want to help the team win. All strikers have that mentality where they want to show what they can do. I enjoy scoring goals. It’s what I love to do. “Saturday was a good day for us but we’ve got two more big games to go before the international break and it’s vital we keep it going. “It’s Maribor and then West Ham – we need six points out of six. Email “Injury-ravaged Sturridge tells Klopp he is 'healthy' and ready to lead Liverpool line”. Feedback on “Injury-ravaged Sturridge tells Klopp he is 'healthy' and ready to lead Liverpool line”.